When Herschel Walker turned pro in 1983, he had an opportunity to commercially endorse several products, but limited himself to just a few. He signed a $1.8 million contract with the Addias shoe company, over a 10 year period. Here is a poster from that era of Herschel stumping for the shoe giant. Gotta love the short shorts of that time period. Walker also inked a 5 year, $100,000 deal with Franklin Sporting Goods. 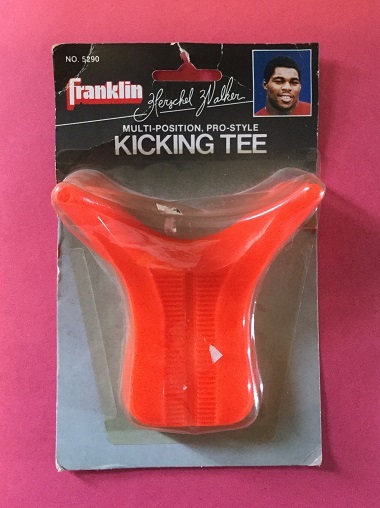 Shown is a plastic football kicking tee I have, with his picture on it. The tee was part of a package of a football, tee and pump, to inflate the ball, but I only have the tee. 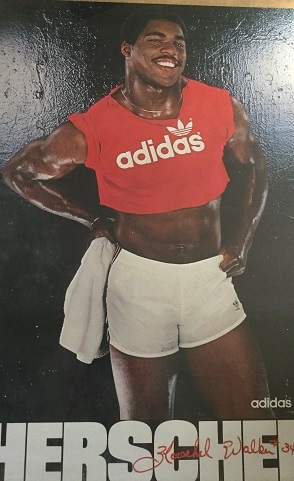 Supposedly, Herschel also signed a million dollar deal with McDonald's in 1983, but I have yet to see any ads showing him and the famous fast food company. Those sums of money don't seem all that impressive in this day and age, but at the time, Walker was easily one of the highest paid athletes in the world, on and off the field. Labels: Addias, Franklin Sporting Goods, McDonald's.